There is one post filed in Russell Westbrook Jersey. For the Oklahoma City Thunder, the biggest offseason question once again resides in a franchise player’s uncertain future — and a pending contract offer. But with more than a month to go before the Thunder can officially open negotiations with Russell Westbrook on a possible five-year extension, Westbrook seemed to provide some clarity as to where his mind is currently at. In a new commercial for luggage company Tumi, the theme is pretty obvious: Oklahoma City is Westbrook’s home. 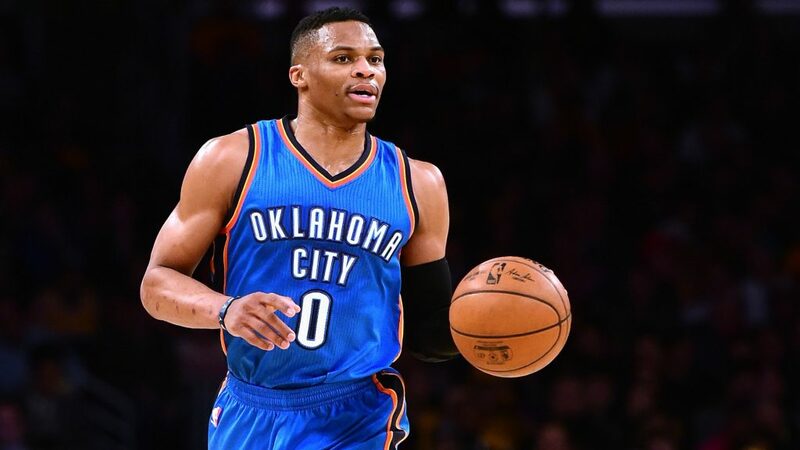 Westbrook signed an extension with the Thunder last summer, a three-year deal with an opt-out on the final season, but he will be eligible for a new maximum contract this summer because of a clause in the reworked collective bargaining agreement. The Thunder are preparing to offer Westbrook the new deal, which can’t be negotiated or agreed upon until July 1. But should Westbrook decline, the Thunder would suddenly be forced into considering options, which may include trading the likely MVP. The expectation from many around Westbrook and the team, though, is that scenario isn’t remotely in the picture, as his 2016 signing was as much a public display of commitment to the franchise as much as it was about a new, bigger contract. Westbrook signed his extension a month to the day after Kevin Durant announced his decision to join the Golden State Warriors. There is a subtle nod at Durant’s departure, too. “The state of Oklahoma loves him more for his loyalty. That’s what we’re built on, loyalty — we’re hard people, man. We stay loyal to who’s loyal to us,” a fan says. “A lot of people could leave the state and go elsewhere.” Part of Westbrook’s brand during the season became about touting loyalty and commitment, playing off the fact Durant was the one that left. With Westbrook, everything is intentional. He’s as calculated, organized and meticulous as any player in the league. From wearing a photographer’s vest to his first meeting last season against the Warriors, to a new commercial that repeats “Now I do what I want” over and over, everything has a purpose. And with more than a month to go until anything could become official, and anxieties beginning to rise around the team’s fan base, Westbrook has a commercial out with a strong message. And if you’re looking for any extra potential Westbrook-Durant shade: Durant often referred to Oklahoma City as “home” during the 2015-16 season, his last in OKC. For Thunder fans and management looking for some level of reassurance over the next month, a commercial where Westbrook is walking around with a suitcase would seem like an unlikely source. But it’s hard to not read between the lines here. Turning down the contact offer in July would basically contradict everything in it, a very un-Westbrookian thing to do, and on top of it, probably make OKC a Samsonite luggage town, too.